Participants of the ADAMED SmartUP science camp during their visit at the modern R&D Centre of the Adamed Group. What does the process of developing medications look like? What can be found in specialist laboratories? This and far more is what the participants of the ADAMED SmartUP science camp learnt during their visit at the modern Science and Research Centre of the Adamed Group in Pieńkowo near Warsaw. 50 young scientists visited the Centre on 16th August this year. During their visit at the Science and Research Centre of the Adamed Group, the laureates had a chance to take a closer look at the specifics of work of the qualified scientific personnel responsible for implementing the research projects of our company. They visited specialist research units and laboratories, including the “In-silico” Molecular Interactions Laboratory, Cellular Biology and Biotechnology Laboratory, Organic Synthesis Laboratory, Formulation and Technology Laboratory, and Analytical Laboratory. The young people learnt the basics of how to run the synthesis of medical substances and the methodology of hypothesis verification studies. They had a chance to familiarise themselves with the modern research devices and laboratory techniques which enable the implementation of drug design projects, involving both generic drugs based on well-known molecules and innovative drugs in which the active substance is a new chemical or biotechnological particle. At the meeting the participants asked a great number of questions regarding the equipment and R&D projects carried out by our specialists. 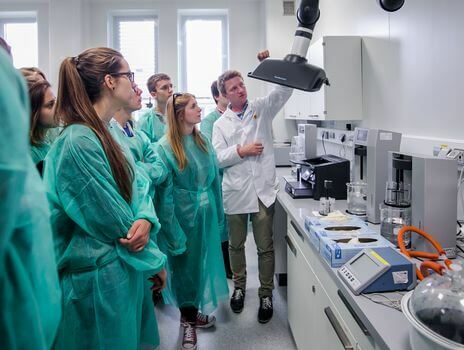 The visit at the Science and Research Centre of the Adamed Group was one of many attractions prepared for the young scientists. They visited also e.g. the Space Research Centre or the Institute of Laser Plasma. The detailed report on the camp is available here.